IT Administrators, System Engineers, Network Engineers, and IT Support Staffs who need to work with Windows Server 2016. 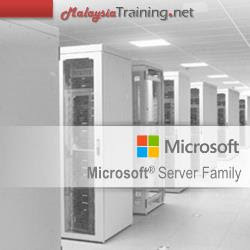 This 4-day Intensive hands-on training is designed primarily for IT professionals who have some experience with Windows Server and will be responsible for managing storage and compute with Windows Server 2016. This course is also suitable for those who need to understand the scenarios, requirements, storage, and compute options that are available and applicable to Windows Server 2016. IT professionals who have some experience with Windows Server operating system. This module describes the direct-attached storage (DAS), network-attached storage (NAS), and storage area networks (SANs). It also helps you understand Microsoft Internet Storage Name Service (iSNS) Server, data center bridging, and Multipath I/O (MPIO).